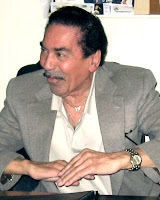 Willie Mitchell will turn 80 next March. If you've been around here a while, you already know that we love us some 'Poppa Willie'. In two separate trips to visit him at his Royal Studio in Memphis, he has been nothing short of wonderful and, despite various health issues, has maintained his sense of humor through it all. I received a letter the other day from Julius Bradley, whose new Gospel album, He Is Coming Back, is now featured over at holy ghost. 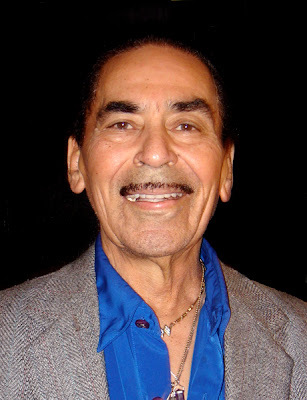 In the letter he says "As you have acknowledged on your website, Mr. Willie Mitchell has not received the honors and commendations commensurate with his lifetime accomplishments and contributions to the Music that has become internationally known as the only true American art form. Recently, efforts have been initiated locally to obtain for Mr. Mitchell the Grammy Legend Award for his contributions to this Music. Any assistance by you will be gratefully appreciated." 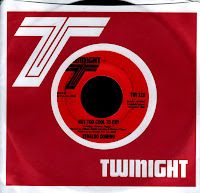 His best known work, by far, is the string of hit records he put together for Al Green in the seventies. 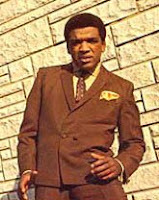 Al charted no less than 26 times between 1970 and 1979, a period in which he would spend almost four months atop the charts with six different singles reaching #1 R&B (not to mention four more that sat comfortably in the #2 slot for another three months). Five more Willie Mitchell produced Al Green singles would also break into the top ten, spending an incredible total of over six years on the Billboard charts. Lord Have Mercy. 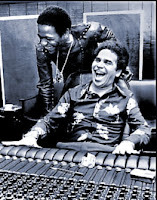 While the world watched a bloated and overmortgaged Stax fall on it's face by mid-decade, Willie Mitchell was around the corner creating his own instantly recognizable 'Sound of Memphis' for his Hi label. An impressive roster of artists that included Otis Clay, Syl Johnson, Ann Peebles and George Jackson would hit the charts on a regular basis for the company, working with the crack 'Hi Rhythm' section to keep that 'sound' out there on the streets. But there's more... a lot more. We just spoke about how Willie Mitchell's tight outfit, as the house band at places like the Manhattan Club and the Plantation Inn, influenced a generation of white kids growing up in Memphis, and how bands like the Mar-Keys came up as a direct result of that influence. Add to that the little known fact that fully one half of the original M.G. 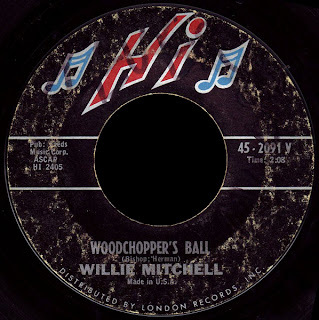 's were graduates of Poppa Willie's band and you begin to see the scope of Mitchell's impact on soul music. Al Jackson, Jr. understood that, and made it a point to continue working with 'the Master' until the day he died. Today's awesome selection (the flip of Buster Browne which would crack the R&B top 30 in the summer of 1965) demonstrates, in my opinion, what I'm talking about. Like a cross between Last Night and Green Onions, the tight horn lines, the Hammond groove, the fat guitar and sax solos over a razor sharp beat mark the foundations that defined the Memphis Sound. Willie did that. 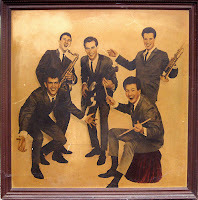 Back then, before the arrival of the Hodges Brothers and Howard Grimes, he was working with folks like Reggie Young, Bobby Emmons, and Tommy Cogbill who would go on, of course, to form the nucleus of the 827 Thomas Street band at American Studio later on. 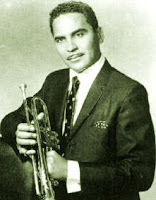 As a trumpet player, Willie understood the importance of brass, and it was at Royal where Memphis Horn legends like Andrew Love, Wayne Jackson, Ben Cawley, and Charlie Chalmers broke themselves in. 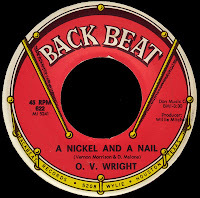 The fact that our current B side here is a cover of a 1939 Woody Herman smash hit provides an indication of how deep Willie Mitchell's musical roots are. He came up working in the big bands of people like Tuff Green and Al Jackson, Sr. and studied arrangement and composition with Memphis legend Onzie Horne. He was there as those bands made their post-war move into smaller ensembles and, as we've seen, laid the groundwork for R&B and Soul. Touring behind top ten hits like Soul Serenade, Mitchell's band remained a popular fixture out on 'the circuit' throughout the sixties. This man has some stories to tell! 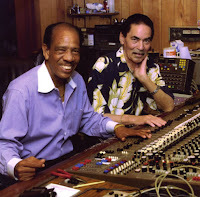 When Hi Records was sold in the late seventies, Willie retained ownwership of Royal Studio, where he continues to produce great music to this day. Despite the able assistance of his grandsons Archie and 'Boo', you can still find 'Pop' behind his desk most days, taking care of business. People continue to knock on the door, and just recently he's been working with several European acts who seem to appreciate his talents more than many in his own backyard. Maybe the fact that John Mayer came down to record some of his Grammy award winning material there last year will help to bring Mr. Mitchell and his landmark studio the recognition they so richly deserve. The fact that the Recording Association bestowed their Lifetime Achievement Award on Booker T & the M.G. 's this year shows that their heart is in the right place. Please join with me and the rest of Poppa Willie's friends in Memphis in helping to convince the Association that he is the right choice for a Legend Award next February. What better way to honor the man on his eightieth birthday? Send an email to: grammyfoundation@grammy.com, or give them a call at 301-392-3777. Len Wade grew up in Birmingham, Alabama, singing Gospel along with his mother while his older brother accompanied them on the guitar. While still in grammar school, he began hanging around on Graymont Avenue, out near Legion Field. Bars like The Quarterback and The Touchdown let him sing along with the jukebox for tips, and he did pretty good. Before long, the young kid with the big voice got to be somewhat of a fixture down there, and the owners of the establishments would sneak him a few beers. Len loved performing for the crowd, and by the time he reached high school, he was playing the bass and leading his own band. 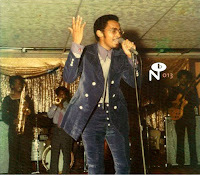 In his senior year, The Len Wade Band was holding down a regular gig at Carmichael's, a popular 'show-bar' in town. As fate would have it, a group that had recently been formed down in Florida was passing through town, and caught Len's act. Their keyboard player, a bonafide original by the name of 'Obed', had just banged himself up pretty bad in a car wreck, and they were looking for somebody to take his place. Despite Len's protestaions that he didn't know how to play the piano, they convinced him to come along and, as soon as he finished school, he went down to join them in Fort Walton Beach on the Florida 'Panhandle'. Founded by their drummer and road-manager, Billy Self, The Tikis included Clyde Masters on bass, Phil Scott on trumpet and Hayes Hopper on the saxophone. With the addition of the soulful Wade on vocals, the band became quite popular, drilling themselves on the tight dance routines and horn lines that made them kind of like a deep-south version of the Mar-Keys. Working with Clyde, Len began to develop his own bluesy piano style, and they'd bring the house down every night as he led them to the 'big finish' behind his high octane R&B delivery. 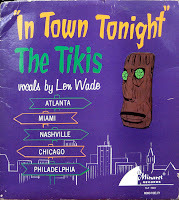 Carmichael's opened up a branch office on the Panhandle called the Club Lido, and The Tikis soon became the house band. They got to know the movers and shakers on the local music scene, including Tom Smith, the program director at Pensacola's WNVY, and a guy named Finley Duncan, who operated a regional jukebox and pinball machine operation. 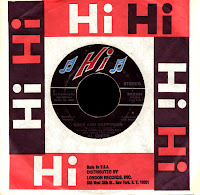 In those days, the guys with the jukebox routes were considered an important part of the record game, and so developed a lot of 'connections' inside the industry. Duncan liked The Tikis a lot, becoming almost like a father figure to the band, and began taking them up to Nashville to record. Finley had formed the Minaret label in 1963, and began collaborating with Herb Schucher, who had been the drummer in Brenda Lee's band, The Casuals. 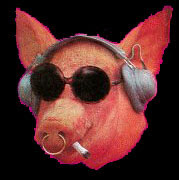 Together they owned Chu-Fin, the label's publishing company, and Herb also ran a booking agency called 'One-Nighters Incorporated' that represented the band. Today's cool selection (the flip of My Bonnie, the Tikis first 45 for Minaret) was produced by Schucher, and arranged by the ubiquitous Cliff Parman. Len's really going off there at the end, huh? Herb kept The Tikis out on the road, playing gigs all over the place as they followed other R&B and 'blue-eyed soul' acts around 'the circuit'. In addition to recording them in Nashvillle, Duncan and Schucher also began bringing them down to a new facility that had just opened for business, Fame Studio in Muscle Shoals. They'd also record in the office of Duncan's amusement company down in Florida when they had to. Len was told by many in 'music city' that he sounded 'too black'. That didn't bother the great Buddy Killen, and he signed The Tikis to his Dial label in 1966. It was Killen who decided to record Wade as a solo act as well, creating one of the true masterpieces of southern soul in the process. Produced by Finley Duncan himself at Fame that summer, It Comes And It Goes is just an amazing song. 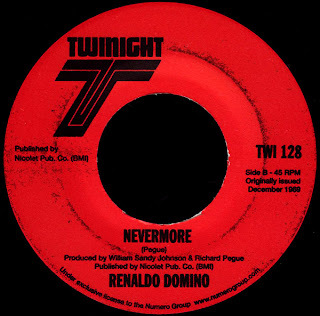 It was written by R.J. Benninghoff, a Nashville songwriter who would go on to work full time for Duncan later on. 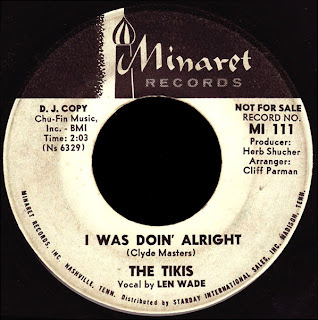 Killen would also release one subsequent Tikis single but, despite Dial's superior distribution agreement with Atlantic, neither record did anything. 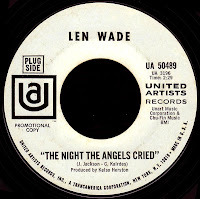 By the end of the decade, Len had signed with United Artists, waxing what would become a big 'northern soul' record later on, The Night The Angels Cried. The big label wasn't quite sure what to do with him, however (their biggest selling artist at the time was Bobby Goldsboro), and by the early seventies, Len had moved on to Louisville to study music theory at Bellarmine College. His professor, a 'jazz cat' named Don Murray was amazed at the chords and voicings Len had developed back when he was 'learning piano by the seat of his pants', and the two men taught each other. 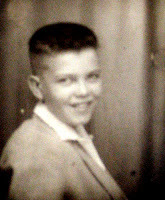 Len would hook up with other Louisville blue-eyed soul brothers like Wayne Young and Marvin Maxwell of Soul Incorporated, and play regulary in the area. He got work in TV, and made Kentucky his second home. 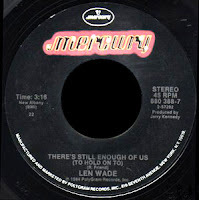 In the mid eighties, Len Wade decided to give it one more go, and signed with Mercury-Polygram, in a deal put together by old Nashville friends in 'the industry' (like Brenda Lee's husband Ronnie Shacklett). Despite sympathetic production from Jerry Kennedy, syrupy singles like Close Enough To Love and It Sure Feels Like Love Tonight reflected the vision the record company had for him. It was just too much for the guys in the front office to think of a white guy recording in Nashville as anything but Country. Back in 1969, Finley Duncan had become partners with Shelby Singleton in building a recording studio adjacent to Duncan's amusement office. They named it Playground, and set about recording some incredible music. With the death of Duncan in 1989, the studio fell into major disrepair. When new owner Jim Lancaster set about the formidable task of restoring the facility, he discovered hours and hours of tapes from 'back in the day'. 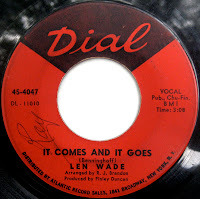 On a tape from 1966, he found Len Wade performing an alternate version of It Comes And It Goes and another incredible R.J. Benninghoff tune, Everybody's Clown. Unreal. 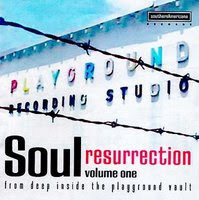 Those two amazing songs, along with a slew of other great stuff, have been released by Lancaster on a CD called Soul Resurrection Volume One. You need to own one. When I heard Everybody's Clown I was just knocked out. How could something this good have gone unreleased? How could somebody with a voice like this not have been huge? Whatever became of him? Well folks, thanks to the wonders of the internet, your very own soul detective was able to track Len down (due in large part to the efforts of Marvin Maxwell - thanks, bro! ), and he consented to meet with me this past June, after I left Nashville. Len was kind enough to share his story with us over catfish and cornbread, and have me back to his house so I could take pictures of all this cool memorabilia (like the 3 foot square oil painting of The Tikis pictured above!). Len said he couldn't believe it when he got a call from R.J.Benninghoff recently telling him to expect a check in the mail. 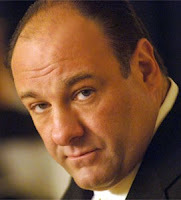 The producers of The Sopranos had decided to use Everybody's Clown during their last season on HBO. Now, how cool is that? We talked for a while about the resurgence of interest in soul music, and how there seemed to be an audience out there that was ready for it. He told me that he still performs from time to time, and had just had a gig that past weekend at the local Mexican restaurant (they loved him). Then Len did something that totally blew me away. He sat down at his piano and played for me. 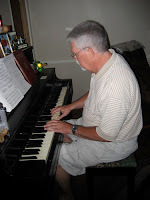 I was in awe as he worked his way through some Brother Ray, Fats Domino, and even some Ernie K-Doe! He was GREAT! I mean, he's more than kept up his 'chops' on the keys... and that VOICE! Just as good as it ever was, man. I'll tell ya what, if I owned a record company, or was any kind of a promoter or anything, I'd sign this guy up in a New York minute! Seriously, here is a major talent just waiting to be rediscovered, folks. It lands, looking up askance through greasy sunglasses, at the feet of the only true 'vegan' guest at my niece's wedding, who begins screaming at the top of her lungs just seconds before the elder (that would be me) hits the ground with a sickening splat. 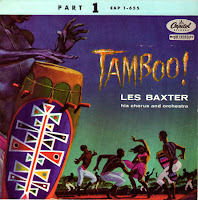 Les Baxter was one of the founding fathers of Exotica, and his late fifties work for Capitol never fails to transport me to another time and place. 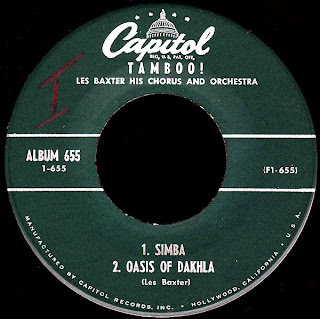 Today's selection is taken from the 1956 original three 45 rpm disc set of Tamboo!, which, according to the liner notes, is the Haitian Creole word for drums. The notes also go on to tell us that this is 'music for every romantic daydreamer'... I stand accused. I'll see you on the flip side!